Run Against Hunger 2018 a success in the sun! 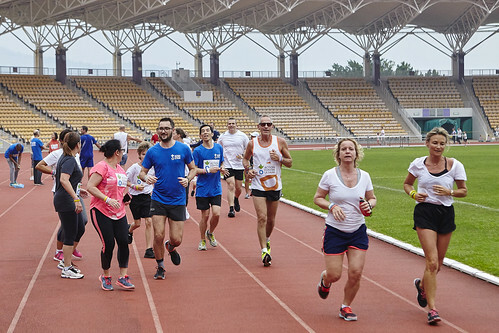 For the 6th consecutive year, the Run Against Hunger brought together many families and teachers at the Siu Sai Wan stadium on Saturday 28 April. From 9am, young and old warmed up beside the track. After a few words of encouragement from the Headmaster, they were off! Throughout the morning, runners of all ages followed each other collecting laps and bracelets to count them. In total, more than 350 runners clocked up over 3,860 laps that morning. Thanks to them and their sponsors, a total of HK$56,350 was raised for Action contre la faim. After running, everybody had the chance to relax in the fine weather and enjoy some fresh fruit in a friendly atmosphere. Certificates were awarded to the best runners in each age group. FIS would like to thanks all the families who got involved this year in support of the charity Action contre la faim.